BENGALURU:You do not expect to see malnutrition in private schools that teach children from comfortably-off families. But a recent survey conducted by AddressHealth, a Bengaluru-based primary healthcare network that collects data from private schools, found that nearly 30% of the children are malnourished. Nearly 60% of Bengaluru’s 24 lakh school-going children are in private schools. 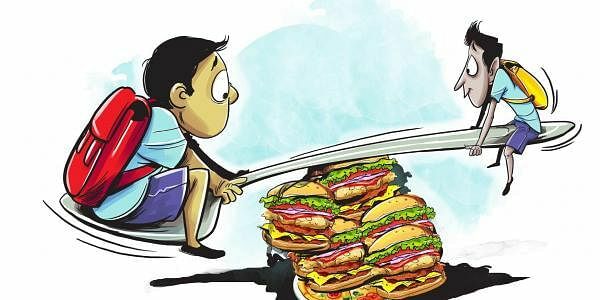 Malnourishment is both overnourishment and undernourishment and, in the city’s schools, the network found 20.7 percent children to be obese and 8.8 percent to be underweight. While obesity or overnourishment was expected, what came as a surpise was the prevalence of undernutrition among children from upper-class families. AddressHealth has been surveying children in private schools every year since 2011, in a process similar to the government’s Rashtriya Bal Swasthya Karyakram. This year the survey was conducted in over 100 private schools of the city and examining 1.3 lakh children from affordable to expensive private schools. Paediatrician Dr Yogesh Kumar Gupta says, “There are underweight children in higher-income groups because of genetics or because the parents are not well educated. It could also be that the child is a fussy eater,” he says. While it was found out that 17.2 per cent on children in higher income schools are more at risk of lifestyle-related diseases, 14.5 per cent in affordable private schools are undernourished. The schools that took part in the survey were classified into three groups -- ones with fees less than `15,000 p.a, schools with fees between `15,000 and `45,000 and those with school fees above `45,000.